Elfinspell: Steuding: IV. Apollon, Artemis, and Hecate, Olympian Deities; Greek Religion from the Beginning of the Homeric Age, from Greek and Roman Mythology & Heroic Legend, by Professor H. Steuding, Translated from the German and edited by Lionel D. Barnett. The Temple Primers, online text. Includes descriptions of Greek and strictly Roman gods and goddesses. From Greek and Roman Mythology & Heroic Legend, by Professor H. Steuding, Translated from the German and Edited by Lionel D. Barnett. The Temple Primers, London: J. M. Dent; 1901; pp. 36-46. IV. Apollon, Artemis, and Hecate. § 67. Of all Grecian gods Apollon had, after Zeus, the highest religious honours in the largest number of places; his sphere of dominion extends to nearly all departments of nature and human life. As far as we can trace him back, he appears as a potent moral personality conceived in thoroughly human form, a power restricted to no particular phenomenon of nature, but equally active in all. The origins alike of his character and of his worship are veiled in obscurity, although some ritual usages indicate for the latter the valley of Tempe in Thessaly. § 68. In the first instance he is a god of oracle; the most highly esteemed place of prophecy in the whole of Greece is his temple at Delphoi, which is already mentioned in the Iliad. He had similar places of worship at Didymoi near Miletos, Klaros near Kolophon, Abai in Phokis, and in many other spots. The name Klăros suggests that at one time oracles were here given by means of lots (Doric κλᾶρος = κλῆρος; compare § 12). In Delphoi, which was also called Pytho or ‘place of questions,’ the priestess styled Pythia (‘she who hears’ ? compare ἐπυθὸμην) drank from a sacred spring and sat down chewing laurel-leaves upon a tripod; then whilst apparently in a state resembling drunkenness she uttered significant words which were interpreted by a priest standing by her side and cast into the form of an answer. Thus the cult of Apollon has close relations with that of Dionysos the god of drunkenness, who was also much worshipped in Delphoi. § 69. As the cause of prophetic inspiration, Apollon becomes patron of all seers and singers, especially as his spoken oracles were commonly couched in the form of verse. 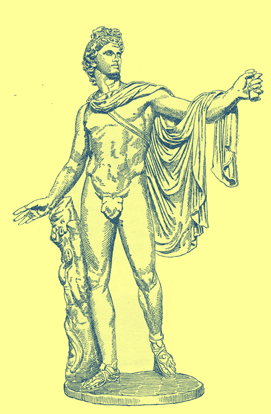 He is hence the leader of the Muses, and receives as regular attribute the lyre invented by Hermes. On the other hand, the fact of the oracle being uttered above a rift in the earth indicates that the Earth or the dead were in earlier times questioned at Delphoi. This is confirmed by legend, according to which Apollon on taking possession of this place slew the dragon Python, which from its connection with Delphoi was also called Delphyne; 37 for this snake is to be regarded as the embodiment of the earth-dwelling spirit of the dead which was formerly questioned here (§ 3). The festival games of the Pythia were later looked upon as a celebration of this victory. § 70. He stands in equally close relations with the earth in his quality as guardian of the growth of vegetation on the pastures (Ἀ. νὸμιος), of cattle-breeding, and of husbandry. He is himself the possessor of herds of kine; his brother Hermes directly after his birth steals them from him, but he is forced to restore them. Aristaios (‘best one’),1 the representative of tilth and of the rearing of cattle and bees, is accounted his son. In the districts at the foot of the range of Taygetos and in the neighbouring Sparta he was worshipped as Κάρνειος (‘ram-god’), and the Karneia, a festival of the harvest and vintage, were held there in his honour. The same meaning underlies the Thargelia at Athens, the Hyakinthia at Sparta, and the Delia in Delos. In the first-named, his seat, the holy tripod, was brought at times from Delphoi into his Athenian Pythion on the Ilissos, and two men (in later times criminals) were slaughtered as an expiatory offering. § 71. In Amyklai and Sparta his favourite Hyakinthos (‘the youth’) was worshipped by his side. He was said to have killed Hyakinthos accidentally in throwing a quoit; originally the latter is probably a god of death and fertility supplanted by Apollon. In general Apollon was accounted the patron of youth and of its exercises in the wrestling-school (Ἀ. ἐναγώνιος); he even became the tribal god (πατρῷος, ἀρχηγέτης) of the whole Ionic race, and led them in their wanderings to their colonies. On the other hand he was also a god of death for men and beasts, and thus is depicted as a terrible sender of pestilence at the beginning of the Iliad. His bolts slay dogs, mules, and men: like a cunning huntsman he never fails to strike his mark. Hence he is termed the ‘Smiter from afar’ (ἑκατηβόλος, ἑκαεργός, ἕκατος), and looked upon both as the god of oaths who takes awful 38 vengeance for all perjury and as the potent helper in the fray (βοηδρόμιος). § 72. If however he sends death, he can likewise ward it off as soon as he has been appeased by expiations and sacrifices. He is invoked as ‘averter of evil’ (ἀλεξίκακος), ‘saviour’ (σωτήρ) and ‘healer’ (Παιάν, Παιήων, Παιών); and Asklepios the physician of the gods is accounted his son. So he is the chief representative of all purification and atonement (Ἀ. καθάρσιος, φοῖβος); for he can grant safety from the pursuit of wrathful souls. The laurel-bough with which the sinner in need of atonement is swept and the wolf, the type of the flying manslayer to whom he offers shelter and expiation, are assigned to him in this quality (Ἀ. λύκιος, λύκειος). Apollon manifests himself as saviour and protector from danger and death by sea as well; hence he was much worshipped by seamen and styled δελφίνιος), because the dolphin accompanies ships on the open seas in good weather, and on this account was looked upon as its harbinger and a friend of the seafarer. In the well-known story one of these creatures rescues Arion, who himself is perhaps to be regarded as a representative of the god graciously guiding shipmen on their way. 41 fall in the summer, has mainly led men to explain him as a sun-god, an interpretation which appears as early as the fifth century B.C. , and seems to suit well the conception of the god as Delphinios and as dwelling in Delos. § 74. In art Apollon meets us as the ideal figure of a fully grown slender youth, beardless, with long curling hair. Usually he is naked; only a small cloak (chlamys) is thrown over his shoulder or left arm. As attribute he carries a bow and quiver, and this was probably the case too with the Belvedere statue. A variety of this type, the resting Apollo, with the hand placed over the head, probably goes back to Praxiteles. As leader of the Muses again he is figured with the long Ionic robe2 (chiton), the lyre, and laurel crown, a type which was created, at any rate in its more agitated form, by Skopas or Praxiteles. 2 This continued as the professional dress of the musician when it had ceased to be the ‘full dress’ of the Ionic gentleman. § 75. Artemis (in Doric and Boiotian Ἄρταμις) is a goddess of fruitfulness and death much worshipped by the whole race, especially in the Peloponnesos. Originally she is doubtless closely akin to Kore-Persephone and Gaia. In Peloponnesos she was celebrated at spring festivals, as goddess of earth’s blessings, not only by the fountains, rivers, and swamps on which fertility depends (Ἄρτεμις λιμνᾶτις and ἐλεία) and on the tilled meadow-lands of the plain, but also in the luxuriant mountain-forests of Taygetos; for through her thrive not merely vegetation but likewise the young of animals and man (Ἀ. παιδοτρίφος). 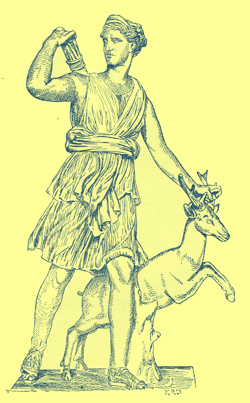 She protects wild and domestic animals; the hind which appears in art by her side, as well as the male and female goat, are sacred to her (Ἀ. κναγία). As a bold huntress she usually carries a bow and arrows, with which she can send death to women also, especially in childbirth (Ἀ. Ἰλείθυια). § 76. To the death-goddess men were at one time offered as victims, as the legend of Iphigeneia shews; and as a substitute for them at Sparta boys in later times were whipped in honour of Artemis (ὀρθία) until they bled, in order thereby 42 to satisfy the ancient demand for blood. In the same way as she brings death she can also bestow salvation, victory, and glory in battle; hence men invoked her as σώτειρα and εὔκλεια). In worship she usually stands alone; but she is also variously associated with other bestowers of fruitfulness such as Zeus, Dionysos, Poseidon, Apollon Karneios, Pan, Demeter, Kore, and Aphrodite. § 77. Sometimes, like the kindred deity Hekate, she carries a torch in her hand (Ἀ. σελασφόρος). This is perhaps the death-torch with which as Ἡγεμόνη, she leads the dead down into the nether world; but on its account she is often explained to be a moon-goddess, and this is borne out by the fact that she was worshipped, as Ἄρτεμις νουμηνία, on the appearance of the new moon. From this point of view she is Apollon’s twin sister, the virgin daughter of Zeus and Leto, and worshipped by Ionian seafarers, who punishes with the utmost severity all breaches of chastity. The hunter Aktaion, the son of Aristaios, having by chance surprised her and her attendant nymphs at the bath, she changes him into a stag in order that his own hounds may tear him to pieces; and for a like reason she slays the giant huntsman Orion, who is raised to heaven as a constellation. § 78. The many-breasted goddess of Ephesos, viewed as the nurturer of all nature, is so like this protectress of the beasts of woodland and field that she too may be termed Artemis, although originally she, like Rhea and Kybele, seems to be only a locally modified form of the great maternal goddess of nature and war, Ma or Ammas (‘Mother’), who was worshipped by the Indogermanic inhabitants of Asia Minor. 45 evidence of a brook Thermodon near Tanagra and of Amazons’ graves and camps in many other spots both of Boiotia and of the neighbouring districts; the Amazons were moreover reputed to be the daughters of the Theban deities Ares and Harmonia. They fought as bold horsewomen with the Corinthian hero Bellerophon, the Boiotian and Argive Herakles, the Trozenian and Attic Theseus, and Achilleus, who was venerated in Thessaly, Boiotia, Corinth, Elis, and Lakonia. Art accordingly depicted them usually as strong and beautiful horsewomen with short garments and armed with a shield hollowed out at the side, often too the double axe. Pheidias and Polykletos made also statues of a single Amazon wearied by the toil of battle. That their legend is based on some recollection of a former rule of women among the races worshipping them cannot be maintained with any certainty. § 80. In Athens, Delos, and Epidauros Artemis bore the by-name of Ἑκάτη, ’Smiter from afar,’ and thus she is in character obviously near akin to the independently developed Hekate, the daughter of the Titan Perses (‘resplendent one’) and of Asterie (‘Star-maiden’). Hekate was chiefly worshipped in Caria and the bordering districts of Asia Minor. In Greece proper a real worship is found only on the eastern coast; she was especially honoured in Aigina by a secret cult or mysteries. She was there invoked to aid against madness, which as mistress of the ghosts causing it she can dispel as well as send. When a soul at birth unites with the body, she is near at hand, and also when it departs thence, at death and burial. She therefore haunts graves; but she also dwells in the hearth, for by it the house-master used to be buried in earlier times. On moonlight nights she herself appears in ghostly form at the crossways (Ἑ. τριοδῖτις, Trivia), attended by her rout, the troop of restless ghosts, and by her dogs, which are also to be regarded as embodying souls (§ 20). To soothe and ward off Hekate the remnants of purificatory offerings were left for her at the end of every month by the crossways, in the same way as the souls of the dead were appeased at the end of the year. § 81. She is the deity of ghost-raising and of magic in general; hence she becomes mother of the sorceresses Kirke and Medeia (‘the wise woman’). She comes also into the closest relations to Selene, the personification of the moon; for the moon can change its form — a fact that figures prominently in all sorcery — and to the night belong all the ghostly apparitions of witchcraft. In older times she is represented as of one form, fully clad, and with two burning torches in her hands; towards the end of the fifth century B.C. however Alkamenes figured her for the entrance of the Athenian citadel with three bodies (τριπρόσωπος, triformis), placing them back to back in such a way that one of them like the waxing moon always looked towards the left and the second like the waning moon towards the right, while that between them fronted the spectator in full face like the full moon. The bowl and flagon assigned to her point perhaps to the drink-offering presented to the dead. V. Hermes, the Satyrs, and Pan.